I suppose it is time for us to recap our Las Vegas experience. We are not going to recap the expo because lets face it, once you've been to one expo, they are pretty much all the same and nothing too interesting happened. The races kicked off on Saturday night with the first one being the 5K. 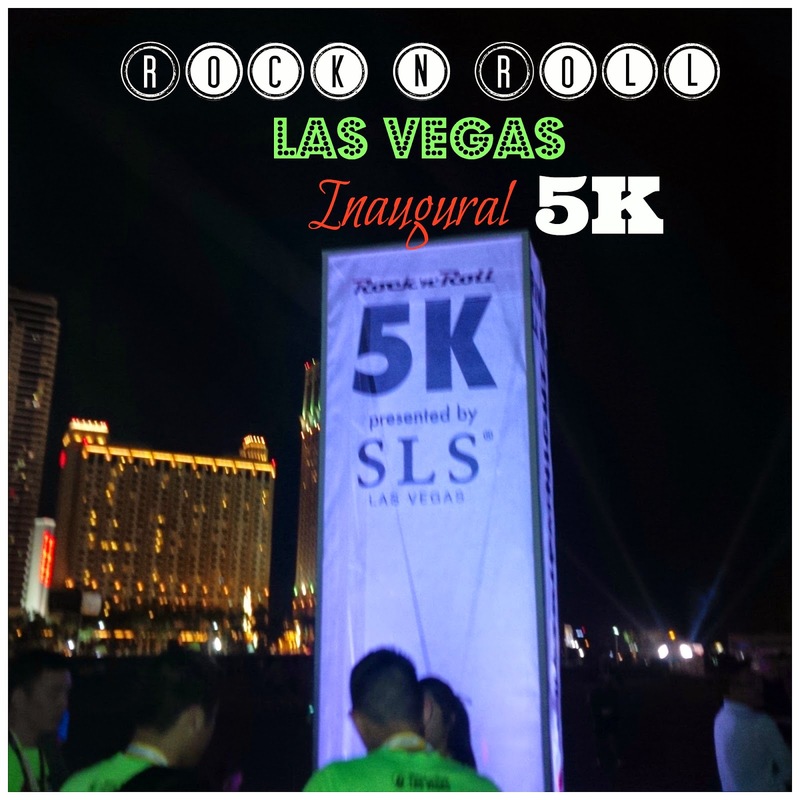 The 5K start, finish, and race village all took place in the parking lot of the SLS Hotel located on the North end of the Las Vegas strip. 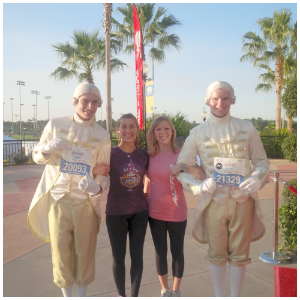 Because our resort was on the North end, we could easily walk to and from the 5K race and the expo. The expo was located at the Las Vegas Convention Center on the North end as well. We were all undecided on what to wear. It was a bit chilly but I knew I would warm up as we ran so I decided to just wear my tank top. Looking back, I shouldn't have worn a black tank top to a night race. Especially when there wasn't anything reflective on it. I'm not sure how many corrals there were, but they must have been more crowded than anticipated because the security started splitting each corral into two. The race stated at 6:30 pm and it was already dark. There was very little light at the start line and beyond. This was kind of a problem because the first little bit was like running through an alley. There was gravel and pot holes and I don't think anyone expected that because I heard a lot of comments about it. People where definitely being cautious right out of the gate. Once we got through that, we were running on the street the rest of the time. This was very well lit but we had to be cautious of the light reflectors along the road. The roads we ran on were not closed down, there was heavy traffic on them. This made the section we were suppose to run on very narrow ( and a lot of it was on the uneven surface of the shoulder of the road). At some points we were able to run on the sidewalk but there were also some non runners walking on them as well so we had to watch for them. The roads were also cracked and full of pot holes. Shortly after mile one a runner in front of us tripped. She went down hard. We made sure she was okay. She ended up scraping her knees. This was a reminder to us to be very cautious on the rest of the run. 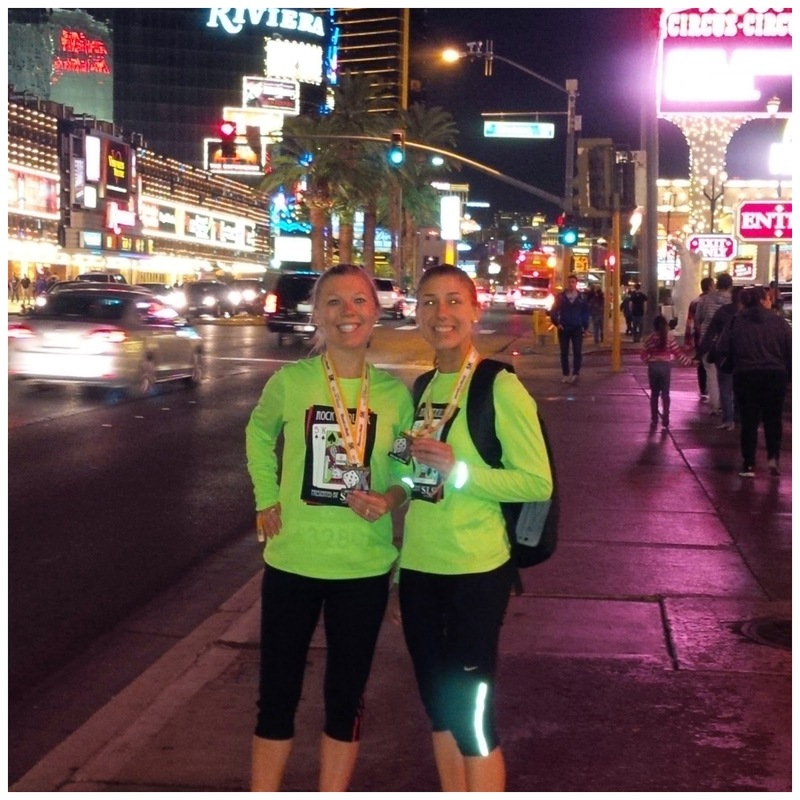 The 5K race was basically a run around the block and we did run on the strip for a little part of the way, so that was fun! The crowd support was really great too. As we came back around to cross the finish line, they had some arches set up with Christmas lights for us to run through. They had the standard finish line snacks and support at the end. We had about a half hour left before the concert started and we were starting to get a little chilly so we just decided to start walking back to the resort. Overall I thought the atmosphere was a lot of fun but I didn't like running beside traffic. 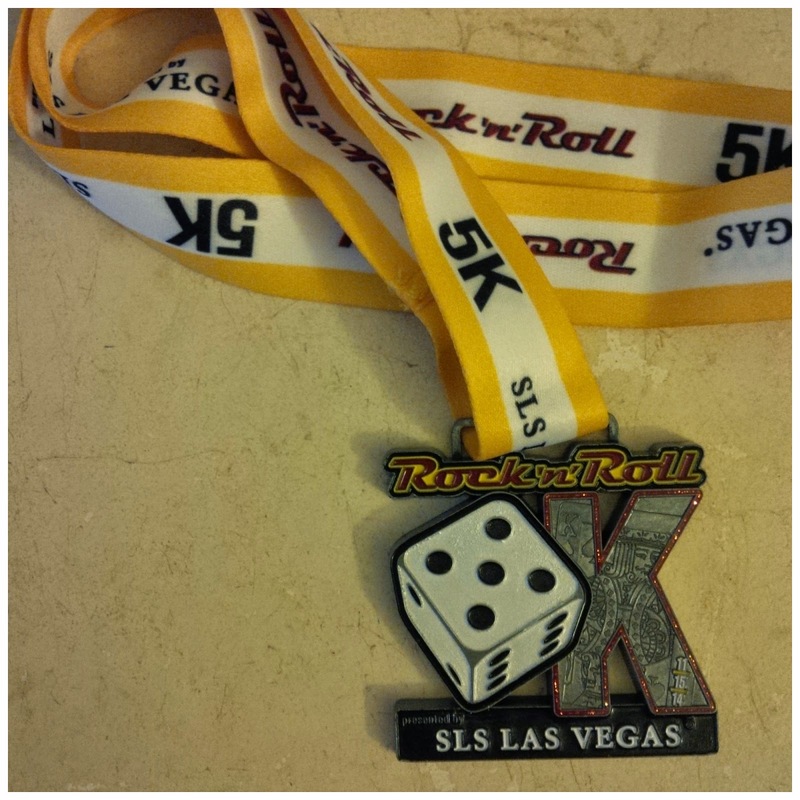 This was the first time that Rock n Roll offered a 5K race in Vegas and I am glad we did it. I'm glad they had a variety of race distance so lots of people could be involved. 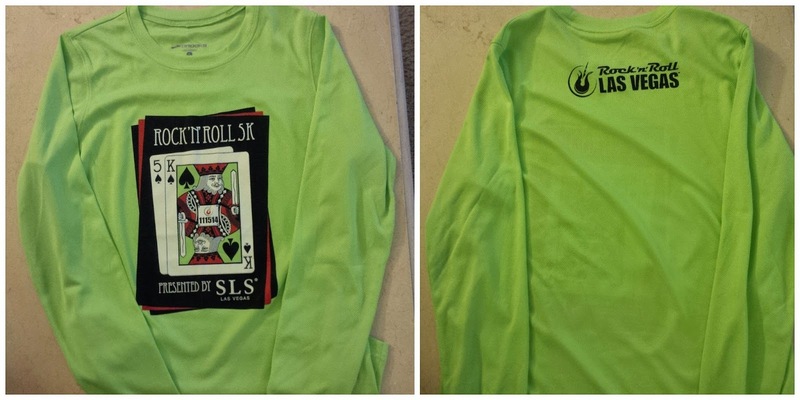 I'm loving the 5K shirt we got and was pleasantly surprised that it was long sleeved. 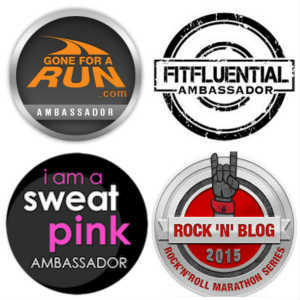 What is your favorite 5K medal? A night race in Vegas sounds like SO much fun. Definitely something that I would do. This was the first night time 5K we've ever done! Wow! I've never gotten a medal for running a 5K - that's fancy! Yes, a pretty nice 5K medal indeed! I've heard of that race series. I'll have to check out that 5k medal! Looks like a blast! I love the medal too! When is your next RnR? Coming to DC? Love the shirt and that is a great medal :) I won 3rd in my age group at a very small 5K and got a medal once ;) I don't think I would love being that close to heavy traffic in a very narrow lane. Maybe next year they will rethink the route! Running on the strip would be fun with all the lights and sights. Congrats on your age group win! Running on the strip was fun but I was a little worried about how close the cars were. I actually don't think Ive ever gotten a medal for a 5k. I love the shirt and medals they gave you! One of these days I would love to do one of the races of Rock n Roll Vegas. Although it would be quite an adjustment to run at night! This was my second race that was at night so I knew what to expect. It's really not that much different than running during the day! Love how they got the 5k on the medal. I'm kind of surprised traffic wasn't closed for the race, was it the same for the half? I always run on sidewalks if I'm outside because cars make me nervous. I was worried that I would have to be just as cautious during the half, but that course ended up being a bit better. I'm shocked to hear about the size of the 5k medal, but that's awesome that its as big as it is! 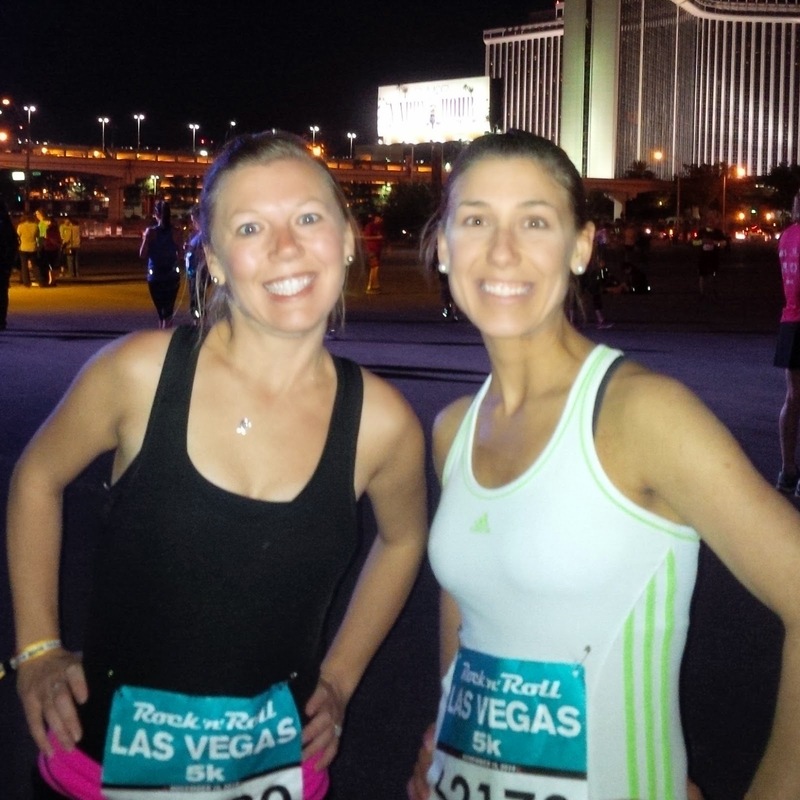 I would love to run RnR Vegas one day! Yes, i'm loving this 5K medal! I've seen full marathon medals that weren't as large! Congratulations! I had 2 friends in that race. I love Vegas, we try to go once a year. I hope your friends enjoyed it! Wow - I think I would have been too stressed by the road conditions to enjoy that 5k. I love the shirt and medal, though. My favorite 5k medal is the I got at the inaugural A Christmas Story Run in Cleveland last year, that's shaped like the leg lamp from the movie, but running. Yes, I remember you talking about that cool race! LOL, we did write similar things! I hope you girls had as much fun as we did, a shame we didn't get a chance to meet up. Isn't that funny that we live so close yet we run the same races that are SO far away? That looks like so much fun! I don't see us visiting Las Vegas as being in the cards for a long time so I'll just enjoy your photos. Wow, I'm surprised the streets weren't closed for the runners. That does sound stressful. I'm glad you were ablt to help the runner in front of you who fell and that she was ok.
That's an awesome medal & shirt for a 5k!!! I would be nervous in Vegas traffic too. People are partying - I wouldn't want to be close to cars whizzing by with drunk people in them. We were there for business and I ran in the early mornings thorough town on the sidewalks. Lots of good distractions - a lot to see! Congrats on completing the race! That is a huge medal! I only ever ran one 5k and there was no medal. "once you've been to one expo, they are pretty much all the same" <------ No truer words have ever been spoken!!!! wow, i'm really impressed that there was a long sleeve shirt and big medal for the 5k! impressive!! I wouldn't have wanted to run along traffic either. Congrats on your race!! 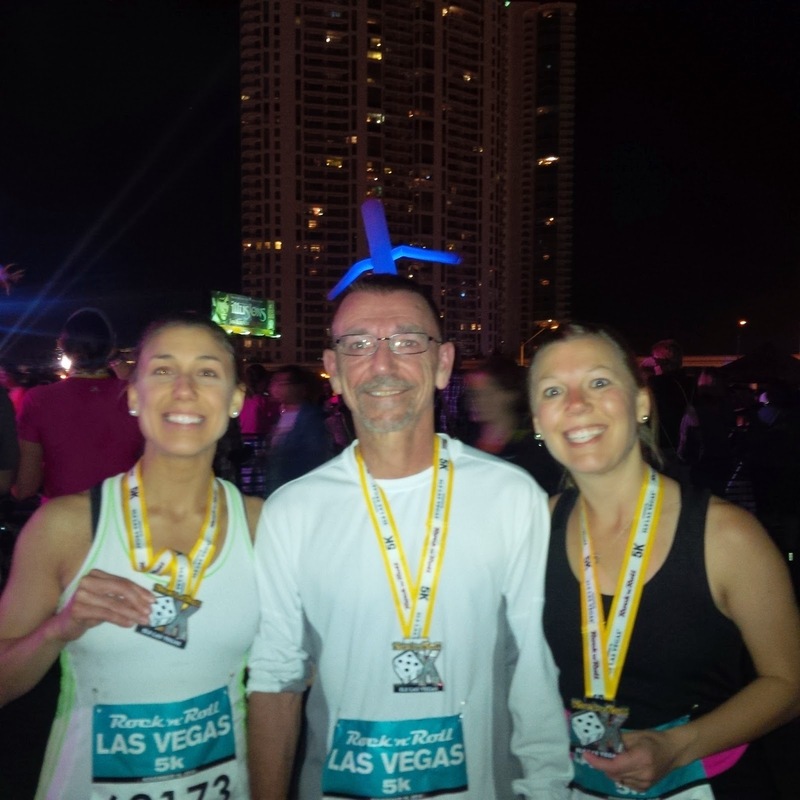 We are hoping to do RnR Vegas next year, but I would skip the 5k. The medal is a nice perk of that race though. The medal is so cute. I love the dice, but running with traffic would worry me especially at night. I over the shirt and medal too. But like you, I would not have like running beside traffic. Also a bit disapointing that they didn't close the traffic down. 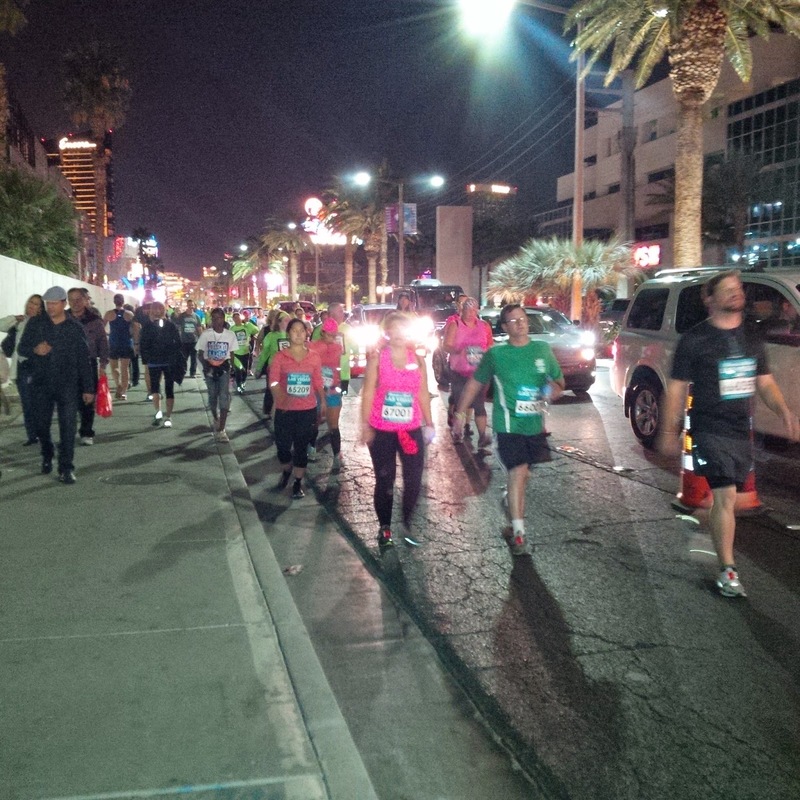 I ran their marathon a few years back, before they switched it to night, and back then they closed off all the traffic and only runners were on the strip and side roads. But very sweet of you to stop and make sure the fallen runner was okay!!!! Very cute medal, I am always surprised when races do 5k medals, and the ones that do, do a great job on them! Great job girls! Love the picture of you guys, you look like you were having a great time just by your smiles alone! Wow, that is some serious bling! Fun! Kind of disappointing about the course conditions I'm sure, and I'm surprised they had you running with traffic! Traffic in Vegas is CRAZY and the drivers are equally as crazy! Wow, such a big medal for a 5K? I had heard that this run was a little crazy, with the LV traffic and crowds. I don't think I'd do the half or the full there. The 5k would be fun, tho!